Funding is vital for setting up and running a lab and for attracting and maintaining student research as well as your own. The resources below offer guidance in finding funding, writing a successful grant proposal, and the general funding process. Role of the Sponsored Programs Office (PowerPoint 2007 (.pptx) 193kB Mar19 12) - This presentation was given by Michelle Christy (MIT) at the 2010 Minority Faculty Development workshop. The presentation explains how an institution works with grant funding agencies and researchers to be successful in gaining and managing funding, using MIT as an example. Preparing and Operating Successful Grants (PowerPoint 259kB Mar19 12) - This presentation was given by Norman Fortenberry (National Academy of Engineering) at the 2010 Minority Faculty Development workshop. It offers some brief tips for writing and managing a research grant. Navigating NSF Programs (PowerPoint 93kB Mar19 12)- This presentation was given by Esin Gulari, (Clemson University) at the 2006 Minority Faculty Development workshop. It provides tips such as essential conditions for submitting an NSF proposal, an overview of the structure of NSF programs, the structure of divisions in engineering at NSF, and suggestions for improving your chances at getting funding. Understanding Engineering at NSF (PowerPoint 405kB Mar19 12) - This presentation was given by Alfonso Ortega (NSF) at the 2006 Minority Faculty Development workshop. The presentation offers tips in obtaining NSF support by providing information on understanding NSF's mission, structure, funding process, and priorities, with a focus on engineering. NSF’s Directorate for Engineering (PowerPoint 4.9MB Jul30 12) - This presentation was given by Richard Buckius (NSF) at the 2006 Minority Faculty Development workshop. The presentation provides information on the Engineering Directorate at NSF, including external forces and trends that are guiding the Directorate, reorganization of the Directorate, and themes of the Directorate. Training and Supporting the Biomedical Research Workforce (PowerPoint 6.7MB Jul30 12) - This presentation was given by Richard Baird (National Institute of Biomedical Imaging and Bioengineering) at the 2012 Minority Faculty Development workshop. It describes the National Institute of Health's mission and provides an overview of the types of funding the NIH is providing to support biomedical researchers and faculty working to prepare of the next generation of biomedical researchers. Research and Training Programs at the National Institutes of Health (PowerPoint 2.8MB Mar19 12) - This presentation was given by Richard Baird (National Institute of Biomedical Imaging and Bioengineering) at the 2006 Minority Faculty Development workshop. The presentation provides an overview of the funding process from the National Institute of Health and National Institute of Biomedical Imaging and Bioengineering (NBIB), including the NIH and NBIB missions and how they differ, the NIH budget, grant review process, grant mechanisms, training and fellowship awards, career development awards, and more. Funding Opportunities (NASA) (PowerPoint 1.2MB Mar19 12) - This presentation was given by Carl Person (NASA/CEOSE) at the 2010 Minority Faculty Development workshop. The presentation provides information about funding from NASA, including what they are looking for in grant proposals, what has been funded, and a description of funding programs and where to find opportunities for funding. NSF and Funding Opportunities (PowerPoint 2007 (.pptx) 199kB Mar19 12) - This presentation was given by Semahat Demir (NSF) at the 2010 Minority Faculty Development workshop. It outlines NSF's vision, funding mechanisms and programs, and merit review criteria, and it provides tips for writing a successful grant proposal. Funding Opportunities - Industry Funding (PowerPoint 2007 (.pptx) 77kB Mar19 12) - This presentation was given by Adin Mann (Iowa State University) at the 2010 Minority Faculty Development workshop. It briefly explains the basics of industry funding and notes important considerations for finding and receiving industry funding. Opportunities for Trainees to Promote Diversity (PowerPoint 791kB Mar19 12) - This presentation was given by Alexis Bakos (National Cancer Institute) at the 2010 Minority Faculty Development workshop. It explains the Continuing Umbrella of Research Experiences (CURE) program and its mechanisms for funding. 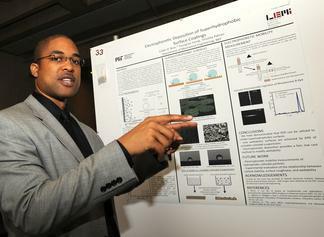 A participant showcases their research at the 2012 Minority Faculty Development Workshop. Presentation describing NSF funding programs (PowerPoint 748kB Mar19 12) - This presentation was given by Juan Figueroa (NSF) at the 2006 Minority Faculty Development workshop. It describes the Small Business Innovation Research and Small Business Technology Transfer (SBIR/STTR) NSF program. Non-Dilutive Funding (PowerPoint 2007 (.pptx) 1.8MB Jul30 12) - This presentation was given by Julie Turner Collins (ATDC/SBIR GA) at the 2012 Minority Faculty Development workshop. It offers resources on small business innovation research and technology transfer. Funding Opportunities: Views from a former AAAS Science & Technology Policy Fellow at NSF/ENG/IIP (PowerPoint 2007 (.pptx) 10.2MB Jul30 12) - This presentation was given by Malathi Srivatsan (Arkansas State University) at the 2012 Minority Faculty Development workshop. It provides information about the funding opportunities currently available through NSF related to Small Business Innovation Research. Funding Support for Research in Science and Technology based Small Businesses (Microsoft Word 2007 (.docx) 37kB Jul30 12) - This handout from the 2012 Minority Faculty Development workshop offers resources and tips for obtaining funding for a variety of small business types. Funding the Startup: Dilutive Capital (PowerPoint 2007 (.pptx) 94kB Jul30 12) - This presentation was given by Stephen Snowdy (Ansley Ventures) at the 2012 Minority Faculty Development workshop. It covers topics such as the differences between dilutive funding sources, what investors are looking for, and the current environment (as of 2012) for private equity and uses an illustrative example to teach about basic concepts and vocabulary of private equity. Emerging Frontiers in Research and Innovation (EFRI) is part of the NSF Engineering Directorate (ENG). Use this page to find solicitations for proposals that "promote interdisciplinary initiatives at the emerging frontier of engineering research and education." Small Business Innovation Resarch and Small Business Technology Trasfer; Supplemental Funding for Diversity Collaborations (SBIR/STTR) is an NSF program that aims to to "increase the incentive and opportunity for small firms to undertake cutting-edge, high risk, high quality scientific, engineering, or science/engineering education research that would have a high potential economic payoff if the research is successful." Use this page to find solicitations for proposals from this program; solicitations are generally in the fields of: biotech and chemical technologies, education applications, information and communication technologies, and nanotechnology, advanced materials, and manufacturing. NASA Solicitation and Proposal Integrated Review and Evaluation System (NSPIRES) - Find research positions or find out how to submit an unsolicited funding proposal. NASA Guidebook for Proposers offers an online (PDF format) guide to applying for NASA grants. NASA Harriett G. Jenkins Predoctoral Fellowship Project (JPFP) website - The JPFP aims to increase the U.S. talent pool of underrepresented groups, including women, ethnic minorities, and persons with disabilities who receive Master's and Doctoral degrees participating in the STEM workforce. NASA Graduate Student Researchers Program (GSRP) website -Administered by UNCFSP, is an Agency-wide fellowship program for graduate study leading to masters or doctoral degrees in the fields of science, mathematics, and engineering related to NASA research and development. National Institutes of Health (NIH) Funding Opportunities and Notices offers a search interface for current funding opportunities as well as information for applying to these opportunities. 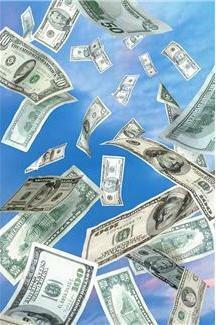 Grants.gov provides a search engine for federal grant opportunities. Use this website to find federal grants, apply for them, and to check the status of your application.